Wombats sleep during the day in their long, multi-chambered burrows. Young men were sometimes sent along a burrow to signal the position of the wombat, so the men above could dig a vertical shaft, leading directly to their target. Eastern grey kangaroos, wallabies and emus were stalked and speared. Ringtail and brushtail possums were smoked or cut from tree hollows and their hides sewn together to make cloaks to keep the clan warm in cold weather. Insects provided valuable protein when game was scarce. Ant eggs and Bogong moths supplemented their diet and sugar bag honey added a sweet treat and an important energy source. Traditional lore and ceremony protected all food sources from over-exploitation. The wombat is believed to be descended from the 2,800kg Diprototon Optatum, the largest marsupial to have ever lived, which became extinct in Australia around 41,000 years ago. Humans came to Australia more than 50,000 years ago and so they would have shared the continent with the megafauna for many generations. Today’s wombat is a much smaller marsupial, with a solid 20 – 35kg body, strong stubby legs and flattened claws for digging. It has been called the ‘bulldozer of the bush’ – it makes a burrow 10-15 feet long with a rounded hollow at the end for sleeping. This may connect to a larger system of tunnels and openings; the preference is for sloping ground above a stream, as this aids burrow drainage. Wombats inhabit a home range of 5-30 hectares. Their incisor teeth grow continually but are ground down as they graze on grasses, sedges and forbs, roots, dry leaves, stalks, mosses and bark. Females produce a small foetus which takes about 20 days in gestation before climbing into the pouch where it suckles for 6 -7 months. The pouch faces backwards so that dirt cannot enter while the mother wombat is digging. The young are weaned at 15 months and are sexually mature at 18 months. They live in the wild for about 11 years. They will defend their territory with kicks, bites and scratches and, although they generally move slowly, they can reach 40km/h for a minute or so when frightened. In their tunnels they will turn their backs to a pursuing predator and block them with their hard backsides – given the chance they can crush a dog’s head against the roof of the burrow. 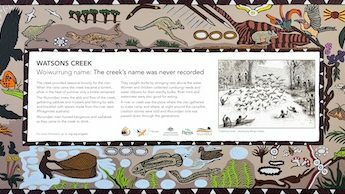 Early settlers sometimes called wombats ‘badgers’, and so Badgers Creek at Healesville was named after them. 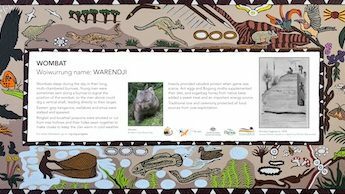 Traditional Uses: Wombats provided a good source of meat for the Wurundjeri-willam people. Sometimes a child would climb down the burrow and signal the position of the wombat, and then the men would dig down vertically from above. Other sources of meat were Eastern grey kangaroos and wallabies, which were attracted to the fresh new grass which grew after fire and were stalked and speared, emus which could be brought within spear range because of their insatiable curiosity, ringtail and brush-tail possums which were smoked out or cut from tree hollows and whose fur skins were essential for the cloaks which kept people warm in winter, koalas, and many other small mammals, birds and reptiles. Koala (Wurundjeri KORBILE): Koalas were also protected by Wurundjeri lore. They were to be cooked whole and thus could not be speared. To capture a koala meant climbing up the tree and bringing it down without breaking its skin. 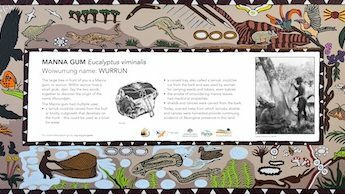 One dreamtime story tells of a young lad left alone in the camp to guard the tarnuks of water. Whilst playing around he knocked them over causing them to pour so long that they filled Port Phillip Bay. Trying to avoid his punishment for carelessness he climbed a manna gum and refused to come down. He turned into a koala with no longer a need to drink water.